He went on to explain that kids could start riding on the course from the age of four or five. There would be midweek and weekend sessions reserved for a local club and schools would have allocated time slots too. He anticipated that 75% of the time would be for general use where anybody could turn up and ride. The campaign have highlighted a long list of reasons why it shouldn’t be built. For the most part these concerns have been answered by the council. Team shelters have been removed from the proposals after thoughts they may be used as hangouts for drug dealers. Black tarmac for the track surface has been changed to green to comply with conservation area guidelines. There was confirmation it will not impede on the Green Chain Walk and the Green Chain Working Party have expressed their support for the facility. The campaign group highlighted that the Woolwich riverside skate park should be extended to include this BMX track. It was noted at the meeting that this skate park is due to be demolished as part of the ongoing Woolwich Arsenal developments. Potential noise pollution was deemed minimal by Peter Cattermoul from British Cycling. A 77 metre radius from the nearest house also seemed to suggest it wouldn’t cause any more noise than that of the adjacent football pitches. Campaigners spoke of parking problems caused by Meridian sports club and Charlton Athletic FC. Public transport and the limit of 30 people per supervised session are said to have stopped the need for additional parking arrangements. “Not all children want to cause trouble, we want this track so we can cause some fun”. Weekly Greenwich Time newspaper was criticised at several points during the two hour meeting. 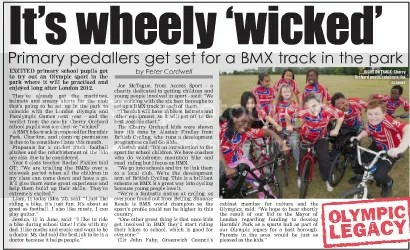 Pictures of children in newly purchased BMX equipment appeared on the front cover of last week’s edition. This enraged campaigners that saw it as a sign that this proposal was already a “done deal”. Former Lib-Dem councillor Paul Webbewood even attended the meeting to talk about the faults of the newspaper and not of the BMX track itself. It seems there were two underlying points that were left for the planning board to make their own judgement on. The first is the clear safety issue. Riders will be unsupervised for three quarters of its opening times. Cycling officials spoke about how races can be self-regulated and how the track met the requirements of ROSPA guidelines. Adequate entrances for the emergency services were mentioned as well as signs that state the need for wearing safety equipment. No doubt there will be accidents but the question is how many and how dangerous a sport is BMX? Could this track instead reduce the need for local children to cycle on roads? There was also the much discussed issue of anti social behaviour, which campaigners have highlighted is currently a problem. Not so long ago the Audit Commission came to the conclusion that sport prevented anti-social behaviour in children. With the addition of the Olympics the government are certainly driving this idea. The redevelopment of the park and lido in general is hoped to populate the park more. Would Hornfair park become a safer place? Or could it get worse as the gates might not prevent mopeds and motorbikes accessing the park? What happens when night falls and the park is closed? Could someone scale the 1.8m fence if they wanted to? Would a bike track increase the chance of someone trying? Barking BMX track, often cited as inspiration for this one, hasn’t been without its own fair share of vandalism. It could be said that half of the people consulted do not want this bike track constructed. With a majority vote plans will be under way and Hornfair Park will have a new addition by September. Previous Article Charlton Park and a Village sandwich bar – can you help?